Festival and Events are becoming increasingly important for Rural Communities in Westmeath in terms of creating a sense of inclusion and a vibrant community spirit in areas. They are also important in terms of generating income for rural communities. The company has supported a number of community based Festivals through provision of funding through the Rural Development Programme. Westmeath Community Development (WCD) now wishes to engage suitably qualified person(s) to undertake a Programme of work with Festival and Event organisers in the county. This will involve working with up to 12 new or emerging community festival committees in rural Westmeath. Establish a progression route for existing festivals that demonstrate a capacity for growth. Provide mentoring to organisers to assist them to develop their festivals and events with a view to participating in “The Gathering” in 2013. It is envisaged that the specialist will work 50 days over a 12 month period in delivering the programme of work from September 2012 to September 2013. Details of any other organization to be used in this contract. Since the very successful ideas2enterprise launches in Mullingar and Athlone, the ideas2enterprise team has been busy collating the information and arranging the next steps. Over 180 people have been involved to date, with 143 expressions of interest received. We have started to contact all the people involved, and this will be completed in the coming days. At this stage we expect in excess of 40 people to be invited back for the Idea Development Workshop. If you have not been contacted to date, please contact Laura Leonard on 0449348571. The ideas2enterprise programme is supported by Westmeath Community Development through the Rural Development (LEADER) Programme. Experience Westmeath will run from 8th to 22nd July and will bring together the very best of Westmeath’s unique craftmakers. From jewellers to textile designers, woodturners, milliners, felt makers and fashion designers to many more. It will also create opportunities for hobbyists/emerging craft makers to showcase their work through two craft events which will be open to the public at two locations during the event, Ballinahown Craft Village and in Mullingar. In Westmeath there is a growing craft presence which has been strengthened in recent years with the opening of Core Crafted Design, the development around Ballinahown Craft Village and the formation of MADE in Westmeath. Groups such as these represent craft makers in Ireland who are creating these handmade pieces in what is mainly a rural location. Some existing craft makers in Wesmeath will open their studios to the public during the event. Groups will attend workshops delivered by the craft maker. Craft makers will also run a series of training workshops during the event at the two locations, Ballinahown and Mullingar. This event has been supported by Westmeath Community Development through the Rural Development (LEADER) Programme. 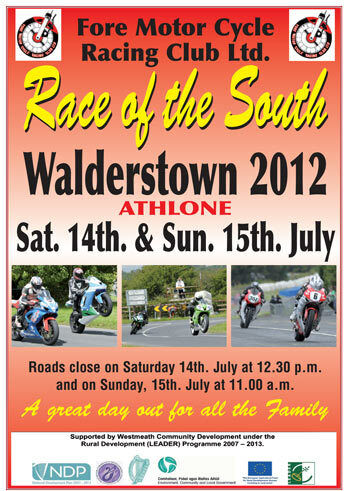 For further information go to www.madeinwestmeath.ie. The 2012 Steete Parish Park Annual Vintage Day will take place on Sunday next July 8th. This is the 11th year of the event that will include vintage displays of steam engines, cars, tractors, stationary engines etc as well as demonstrations by exhibitors throughout the day. This event has been supported by Westmeath Community Development through the Rural Development (LEADER) Programme.